Miami: Roger Federer edged closer to his fourth ATP and WTA Miami Open title on Wednesday, swatting aside Russia's Daniil Medvedev 6-4 6-2 in only 61 minutes. In a clash postponed from Tuesday due to heavy rain, the 20-time Grand Slam champion -- celebrating 20 years at the South Florida event -- sealed a last-eight meeting with South African Kevin Anderson in ruthless fashion. Medvedev was in fine form, the 23-year-old having won his fourth ATP career title in Sofia last month and aiming for his first Masters 1000 quarter-final. 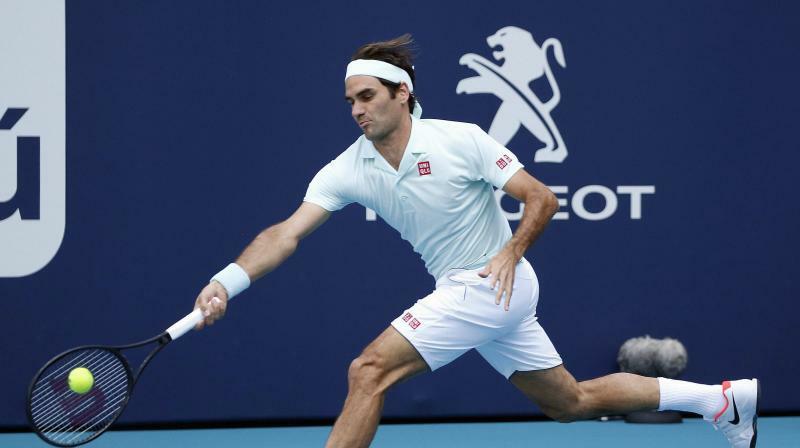 But in front of a packed center court, Swiss legend Federer rolled back the years with a dominant display to serve notice of his intent to land his 101st career title in Sunday's final. "The key moment was when I held at the end of the first set but in the second I played well and really went for my shots," Federer said. And he expects the best in the quarter-finals from Anderson despite the South African's recent right elbow injury. "I am happy to see Kevin playing again after his injury problems," Federer said. "He's one of the best servers in the world." Halep needs only to reach Saturday's final at Hard Rock Stadium to knock Naomi Osaka from atop the women's rankings despite the Japanese star winning her second major title in this year's Australian Open. Halep, who rallied from 5-1 down to take the second set, will try to reach her first South Florida final and reclaim the top spot by defeating the winner of a later all-Czech contest between world number five Karolina Pliskova and Marketa Vondrousova. Evergreen Federer took control with an impressive opening set. The 37-year-old Swiss was working well behind a solid service game -- he won 81% of points on his first serve and finished the match on 85% -- and also saved all three break points the Russian mustered. The key sequence came when Medvedev was broken for 5-4 before failing to take the chance to make amends in the very next game. Federer found himself 0-40 down but managed to hold before proceeding to seal the first set. An instant break at the start of the second marked the beginning of the end for the world number 15.